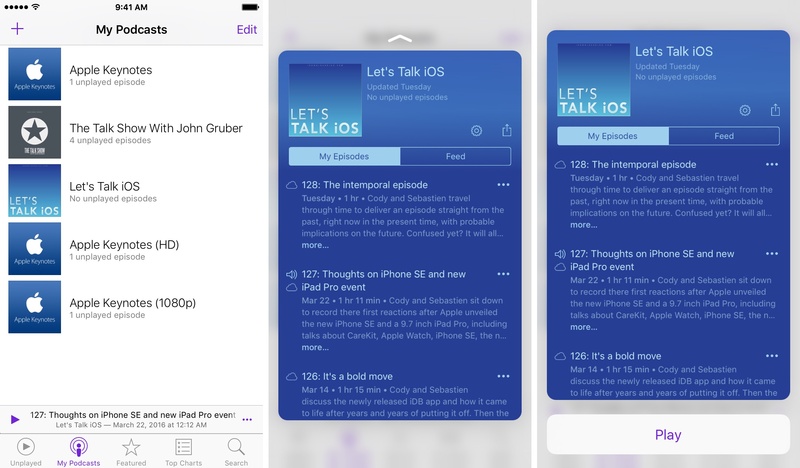 Podcasts, previously an optional download from the App Store and now a stock application in iOS 9, may not be the most elegant software to enjoy your favorite podcasts, such as iDownloadBlog’s Let’s Talk iOS series. That being said, the app is adequate enough for basic use: with it, you can easily browse, subscribe to and play your favorite audio or video shows on your iOS devices. 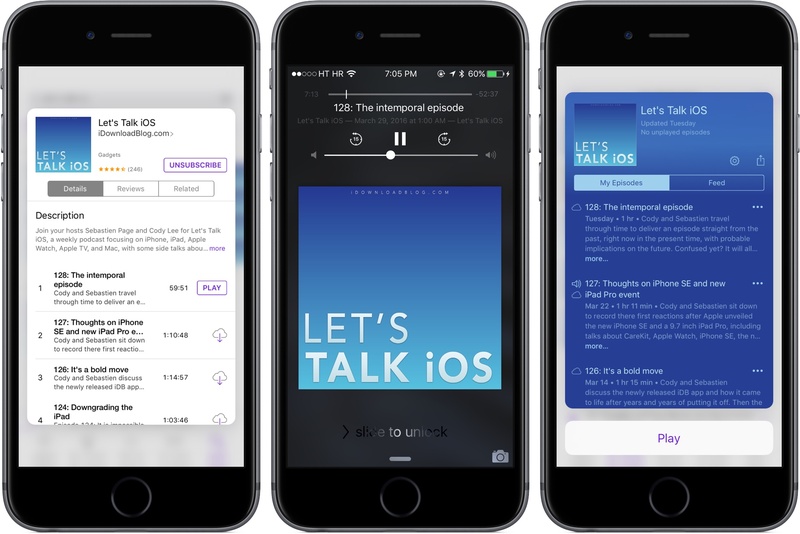 And if you own an iPhone 6s or iPhone 6s Plus, you can take advantage of 3D Touch to start listening to the next unplayed episode of your favorite show right from the Home screen, use Peek and Pop gestures in the app to preview shows, see unplayed station episodes and more. 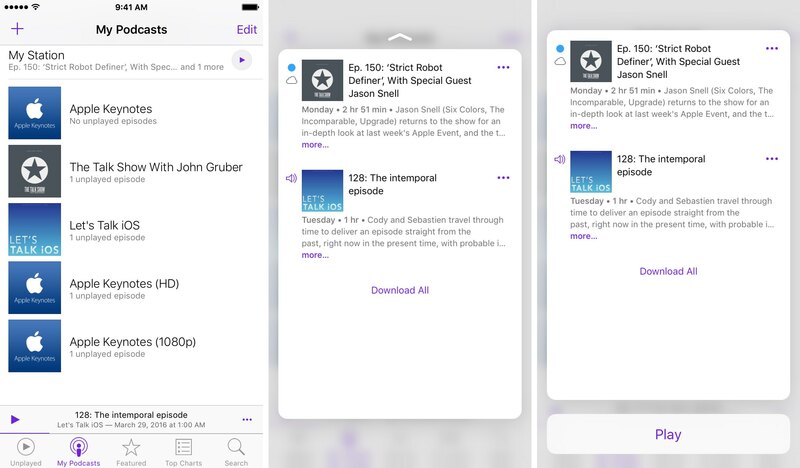 With Quick Actions that are available in the 3D Touch shortcuts menu upon pressing the Podcasts app’s icon, you can jump into your favorite show right form the Home screen. The menu lists up to four shows you’re subscribed to and tapping an item launches the app and the selected episode starts or continues playing right where you left off. As a cool bonus, the shortcuts menu conveniently tells you if an item is part of a series of unplayed episodes (Next Episode) or the most recent episode (Latest Episode) and you can even see how much time you have left on your most recently played, but unfinished episodes. Tap My Podcasts in the list of tabs alongside the bottom. Then, on your iPhone 6s or iPhone 6s Plus press a title of the show you’re subscribed for an at-a-glance overview of its episodes. To listen to, or watch unplayed episodes, drag your finger upward while peeking then choose Play to play them. Or, press a little deeper to browse that podcast’s episodes in full screen mode. 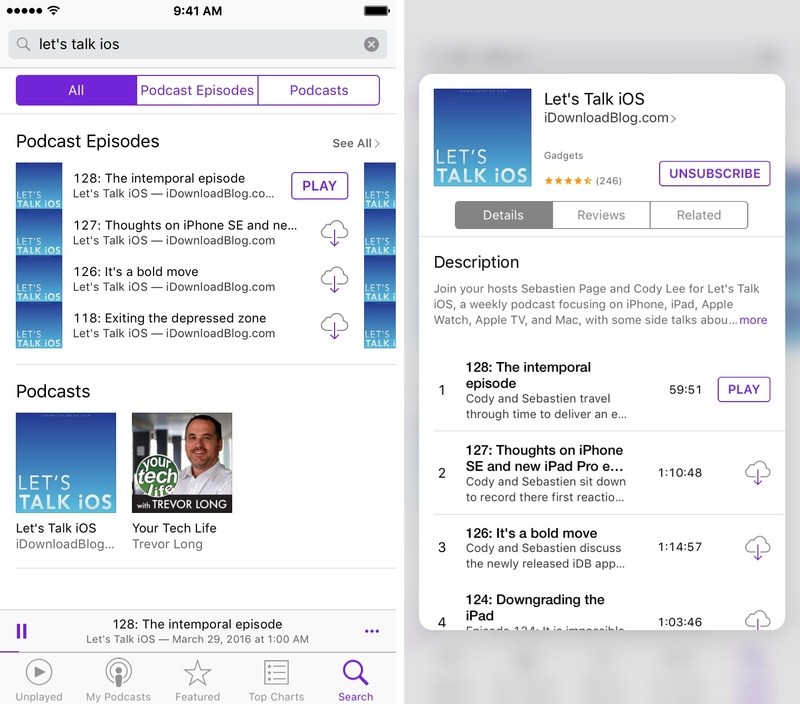 To browse podcasts on the iTunes Store, tap the Featured tab at the bottom of the app. 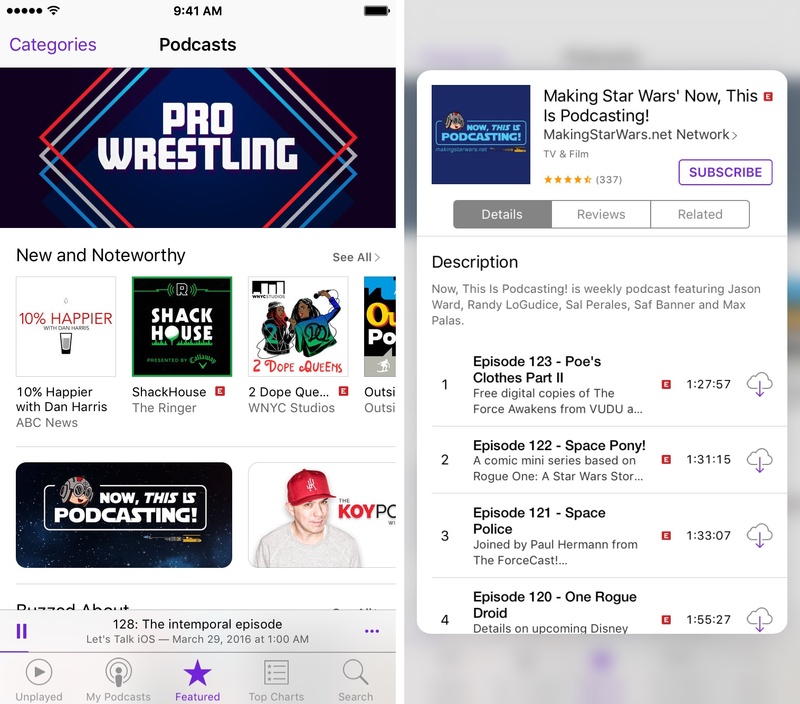 This loads the Podcasts section of the iTunes Store where you can browse shows by category, check out descriptions, subscribe to podcasts you love and more. 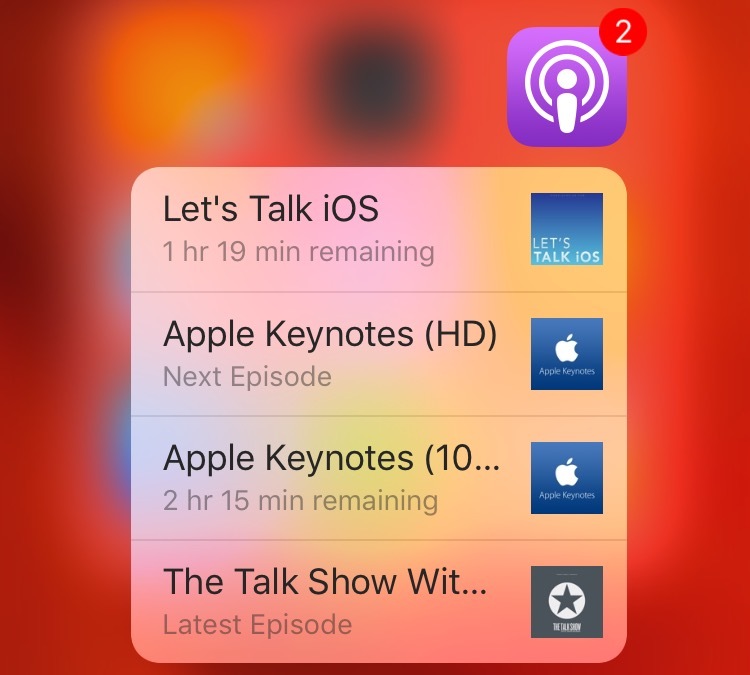 With 3D Touch, you can press a show title to preview the item’s description and see a list of most recent episodes. Peeking works in search results, too. Tap the Search tab and then type a query into the search filed. Then, in search results press any item underneath the Podcasts heading to preview it. To open the item, press a little deeper. Keep in mind that you can peek at whole shows, but not preview individual episodes listed under the Featured and Search tabs. You can organize your favorite shows into custom stations to have individual episodes automatically updated across all devices. To create a station, tap My Podcasts and select Add Station. Name your station, tap Save and then add some shows to it. Your stations are listed at the top of the view in My Podcasts. To play a station, hit the Play button next to it. On the iPhone 6s or iPhone 6s Plus, you can press a station to preview its episodes. Then, swipe up while peeking and choose Play to play that station’s unplayed episodes. Or, press a little deeper to browse the show’s episodes in full screen mode. Were these tips helpful to you? Feel free to share your own tips in the comments. Not sure how to do certain things on your Apple device? Let us know at help@iDownloadBlog.com and a future tutorial might provide a solution.